When you’re traveling with your family, and there’s just not enough space in the car for all the people and gears, a rooftop cargo carrier can give you that extra space. Your kids no longer need to squeeze in between bags of camping gears. Get those bags on the carrier and your family will have a more relaxing trip to the camp site. Many people prefer roof racks to hitch-mounted racks because roof racks don’t block the rearview mirror when fully loaded. With roof racks, you also don’t need to worry about hot exhaust melting your sleeping bag, luggage, or whatever it is you need to take on your trip. all of them are high-quality racks that help you carry tons of gears and stuff. Nine out of ten racks require crossbars already installed on your car roof. If you don’t have them installed yet, you can go with number ten which uses clamps connected to the door sills. This is a lightweight rooftop cargo carrier that’s easy to install on standard roof rack using its universal mounting bracket. It comes in two large pieces, so you don’t have to do much putting them together. It measures 43.5-inches x 37-inches, and you can pack a lot in it. If you feel that’s not enough, there’s an extension available to give an extra 21-inches. The rack’s front part has an aerodynamic design to reduce drag and make sure you still get good mileage. This simple feature is very advantageous when you’re going at high speed. The whole rack has durable powder coating to protect it from corrosion and the elements. You can leave it installed, and it will hold up to summer heat and downpours. With 4-inches tall rails surrounding the rack, you have plenty of anchor points tie downs to secure your cargo. These railings also help to prevent the load from sliding off. The Rola Vortex is a nice-looking roof cargo basket that goes well with many car makes and models whether it’s a hot hatch, minivan, or SUV. Following the easy-to-follow assembly instruction, you can put this together in no time. In total, this roof rack only weighs 38-pounds, which makes it easier to install. It also means it won’t add much to the total weight of the load that the roof has to take. With universal mounting brackets, the Rola Vortex will fit oval or flat crossbars without any problems. All hardware required to install the rack is already included for your convenience. The durable steel tube construction is coated with black powder coating to ensure it will stand the elements. The air deflector on the front and the overall low profile reduce drag and wind noise when you’re going through highways. Whatever kind of roads you’re taking, this rack will hold up really well. This thing is one of the longest cargo roof racks on the market. It’s 64-inches long when you assemble it using the included extension. Yes, you don’t need to buy the extension separately, and that alone is a major plus against its competitors. With 250-pounds of weight capacity, this thing can take tons of your of camping gears, bags, and more. The size lets you distribute the weight better across the roof. 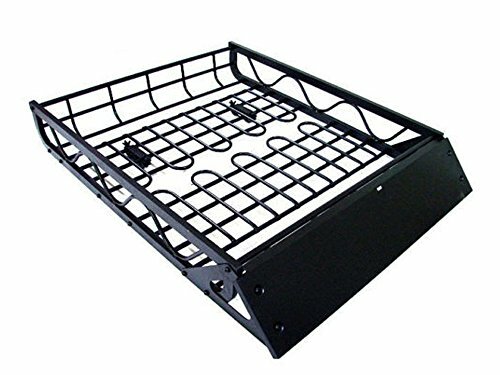 This rooftop rack is made of durable steel tube construction with excellent paint quality. Installing the rack is as easy as fastening the four plastic clamps. For the assembly, you only need to fasten several screws to join the three parts. It’s so easy; you can complete it in minutes even without consulting the instructions. Just make sure you assemble the steel cover plates on one side first and tighten them before continuing with the ones on the other side. By using aluminum instead of steel construction, the TMS ALUM carrier weighs a mere 21 pounds. That makes it easy to mount on the roof rack. Since aluminum resists rust very well, you don’t need to worry about spraying additional coating to protect the frame. This cargo carrier can withstand whatever mother nature throws at it. The heavy-duty nature of this carrier is apparent when you look at the construction. This thing is rugged, sturdy, and ready to carry anything you need for your camping trip. Using locking brackets, this carrier basket can be secured to the straight bars and crossbars using factory locking brackets. That’s a nice theft deterrent there. The basket measures 50-inches x 39-inches, and no extension is available. Still, with its 200 pounds of weight capacity, it’s big enough and strong enough to haul serious loads. With plenty of tie down points, you’ll have no trouble keeping your load secure too. This good-looking cargo top carrier uses 1-inch diameter steel tube frame for the outer part and 0.5-inches diameter steel on the inside. The wind deflector, however, is made of plastic. It’s not a deal-breaker, but it certainly not going to last as long as metal ones. It doesn’t have any decals on it so that you can put your own print there. The steel construction is well-built, sturdy, but still lightweight for a steel cargo basket. For the assembly, there are two large parts that you need to put together using the side plates. That’s it. It’s straightforward and shouldn’t take too much time. Rubber washers and sleeves are included, so the two halves are tightly merged without any opening for rainwater to seep in. Once assembled, the rack gives off 150-pounds of weight capacity. That’s pretty standard for a roof rack, and for most people, that’s more than sufficient. Like most car luggage carrier, this one uses the combination of 1-inch and 0.75-inches steel tubing. The rack is finished with thick powder coating like any decent rack should. Once assembled, the measurement is 44-inches x 39-inches. The sidewalls are 6-inches high. That’s tall enough to give the luggage and bags proper support so they won’t slide off. 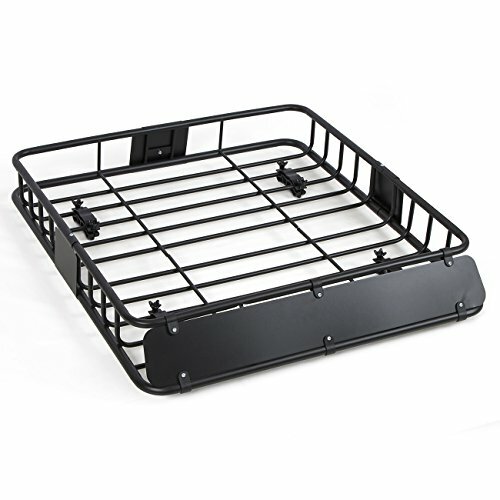 Installing this carrier basket is a snap using the included tools and hardware. You’ll only need an hour, tops. Mounting uses universal U-bolts, and they will fit round and square bars. The bolts stick up a little bit, but you can cut them, so they flush with the rest of the rack. There’s no extension available, so if you think you’re going to need higher loading capacity in the future, you should invest in another rack. This car top carrier exceeds expectation, and should last quite a while. If you’re running on tight budget and doesn’t mind using a car luggage carrier from an unknown brand, then this one should suit your need. It is one of the most affordable choice out there. That’s not a bad thing, though. 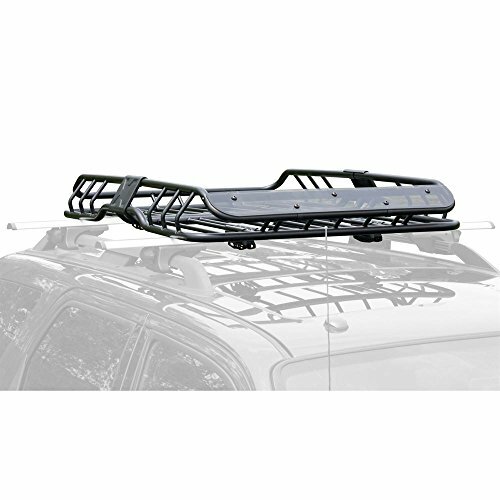 This rack has everything you need from a roof rack. First, is the steel construction. It’s strong enough to take 150-pounds of distributed weight. Even when you’re camping with the whole family and taking loads of camping gear, that should be more than enough. The surrounding sidewalls provide plenty of tie down points, so whatever it is your bring, you can secure them easily so they won’t slide off during transport. Ease of assembly and installation is on par with other steel rooftop carrier. You only have two large parts to put together. Even if the instruction is far from the best, you can still figure out how to put the two together with minimal effort. This Rhino cargo basket is truly well-made. Its build quality is better than some of the competitors by far. You can tell from how the rack is packaged in its box, and you can certainly tell from the overall fit and finish. It measures 57-inches x 42-inches, big enough to fit your luggage, bags, gears, and more. The 1-inch metal tubing surrounding the rack makes excellent tie down points. They’re strong, sturdy, and certainly dependable in securing your cargo. Assembly and installation are straightforward. There’s no case of screw holes not lining up, no need to drill extra holes like some people need to do when they buy a low-quality roof rack. 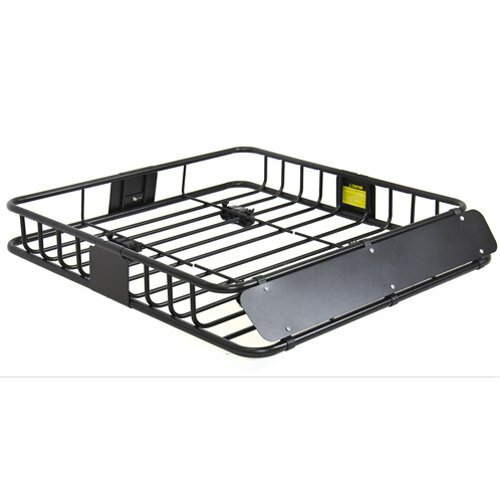 This Rhino rack has universal fit, so whatever crossbars you have installed on your car, this will fit right in. The wind deflector does a good job in reducing wind noise. It’s not made of metal, but like the rest of the rack, it looks like it can take a beating. Hauling serious cargo without burning a hole in your pocket to get an expensive roof rack is made possible when you choose the ARKSEN car luggage rack. 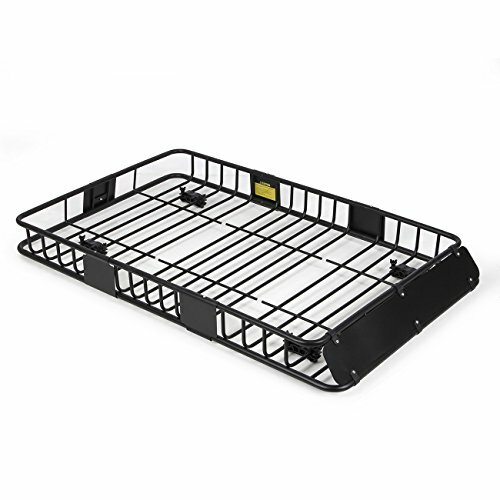 It doesn’t cost a fortune, but it’s a solid rack that will suit all kinds of cars. You’ll have peace of mind that during your long road trip, the rack can keep your luggage and camping equipment secured. The rack installs effortlessly using universal U-bolts. It fits round crossbars up to 1.375-inches in diameter as well as square cross bars up to 1.375-inches thick and 3.25-inches wide. The side rails surrounding the basket is 5.5-inches tall. Not the tallest side rails you can find, but it’s more than satisfactory to keep your luggage in place when you speed, turn, and go through bumpy roads. The side rails are made of 1-inch diameter steel tubing. They’re tough and provides excellent tie-down points throughout. When you need a roof rack but you don’t have crossbars installed, the Merax cargo carrier is the one you need. This rack sits on the roof and is secured using four hooks that grab the door sills. It fits various roof designs including the ones with sloping lines on the back portion like SUVs. This Merax luggage carrier comes in parts and assembly will take a while. You have to connect the ten metal tubes to the side rails. Installation is pretty simple, though. Just position the four hooks and tighten some screws. Without any wind deflector on the front, wind noise is very perceptible. You may also notice a decrease in your mileage. You can fix that by using a tarp to cover the cargo to reduce the drag and turbulence. Those two are the two main causes of mileage drop when using a car top carrier. Easy assembly and installation: A car top carrier usually comes in two or three parts. That means you don’t have to mess with too many small parts to make it work. Installation usually uses four clamps to attach the rack to the crossbars. The details vary by models, but they are all relatively simple. Wind fairing: It’s only natural for roof top cargo carrier to cause wind noises and decrease in mileage. A wind fairing is just a simple plate attached to the rack at an angle to make it more aerodynamic. When installed, it can reduce the wind noise greatly and also helps with the mileage. Sturdy side rails: Side rails prevent the cargo from sliding off. Sturdy side rails also serve as tie-down points, so your cargo is secured better. 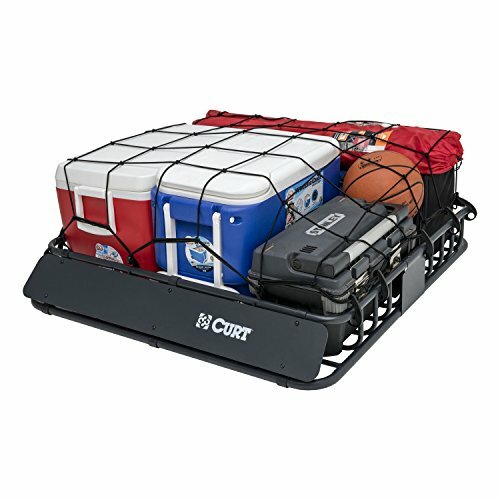 Size: A good cargo basket will be big enough to haul everything you need. Bags, spare tires, firewood, and basically anything you can’t cram into the car. Roof racks generally require crossbars already installed on your car roof. However, if you don’t have crossbars and don’t intend to install them, there are some roof racks that mount to the door sills that you can buy. Rack manufacturers don’t seem to care much about printing informative assembly and installation manual. Don’t be discouraged when the rack you want have bad reviews regarding assembly or installation. You have YouTube for that. Even if you can’t find the exact make and model, the process doesn’t vary that much. Whenever possible, buy a carrier with a wind fairing. That thing helps with wind noise and mpg. Make sure the cargo basket is not too long for your car. You may not be able to open the rear hatch if the basket extends too far back. Cargo net: A cargo net easily secures your stuff. It’s very affordable, easy to hook onto the side rails, and you no longer need to worry about losing your stuff while speeding down the freeways. In short, you really should get it. Ratchet tie down straps: If you don’t feel like using a cargo net, then ratchet tie down straps will make a great alternative. You should get extra-long straps, about 19-feet or so, to make sure they can secure big loads end to end. Heavy-duty straps with rubber handles don’t cost much, but they will give you the peace of mind of having all your load secured tightly on the roof carrier. Rooftop bag: A bag is essential to keep your load dry. If you have suitcases or bags with clothes in it, a waterproof rooftop bag is a must. Tarps work well for light rain, but driving through storms will soak your load in no time when they are not put inside a waterproof bag. Use caulk, Rustoleum, or RTV silicone on the seams to prevent water from getting into them and form rusts. This simple step can ensure the longevity of the rack and also prevents that annoying rusty water drip when it’s raining. Too many people forgot to follow this simple prevention method and ended up throwing their roof rack to the dumpster. While you’re at it, consider using spray on bed liner to add more layer of protection on the frame. Use Loctite on the screws so you don’t have to retighten them too often. Do a test drive once you got the rack installed especially if it’s your first time using a rooftop carrier. You can practice with the tie downs to make sure the loads are secured properly, learn how fast can you turn without worrying about the load falling off, and gauge if that wind noise is something you can bear during the hundred miles trip. Wind noise in unavoidable. If that bothers you, turn the music up to cover it. You can remedy any rattling sounds by putting foam or rubber inserts between the parts that are too close together. For instance, between the rack and the crossbars. Doing this will make traveling through bumpy roads more bearable. You can also try raising the rack about half an inch over the bars, but if that isn’t feasible, just go with the foam inserts route. 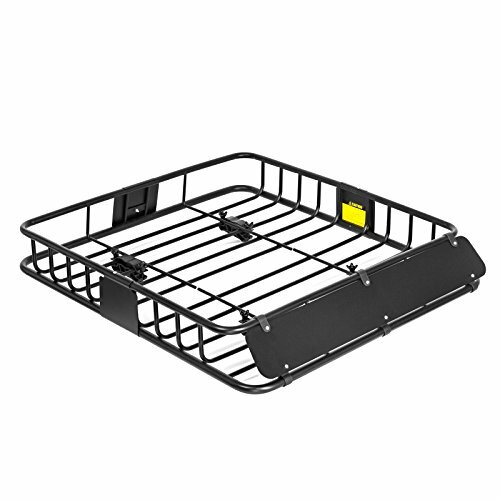 When going through rough terrain or off-road, your load and the rack will be more protected. Great for carrying long stuff like kayaks or snowboards. No need to worry about hot fumes from the exhaust melting anything plastic on the rack or the load. Doesn’t obstruct rear view mirror. No extra protection required when crossing a body of water. Rooftop carriers affect your car’s mpg. They increase drag, so your car needs to burn more gas to get to speed. How bad the effect is depends on whether you have wind deflector installed and how you organize the cargo. Hardtop racks are too limiting in the size of stuff you can pack in it. Bulky suitcases are impossible to fit in. Satellite radio reception may be compromised. Remember that how good or bad the pros and cons are depend on your own preferences and conditions. For example, if gas is so cheap in your area, you may not worry too much about the mpg stuff. That’s all for your top selection of rooftop cargo carriers. If you’re in the market for one, any one of those will be a fine choice. You just need to pick one based on your personal needs and circumstances. Please keep in mind that if you have a small car, don’t go for the biggest roof rack there is. Consult the owner’s manual to check the maximum weight your roof can hold safely. Be safe and have fun on your next outing.